We published a post recently detailing our powerful new content marketing feature that allows you to add any article, image, post, or practically any URL to your social wall with just a click of a button. 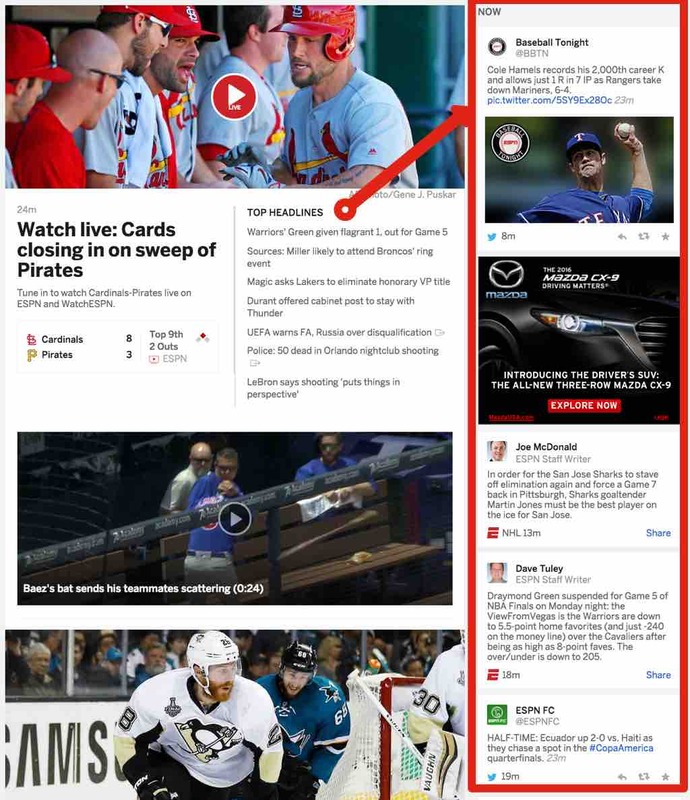 Inside that article, we briefly mentioned ESPN's website design, specifically the ESPN Now panel that is a highly topical, and relevant news feed. Typically these mini news bites center around comments by the ESPN anchors and journalists, or links to longer form articles, videos published by ESPN. It's a highly engaging widget that keeps readers coming back to their site for up to the minute content, and typically ends up staying longer as they discover some of the longer form content that is presented next to the Now panel. Speaking personally, I know I visit ESPN much more since the introduction of this real time content widget on their website last year. FastCompany and TheVerge both wrote detailed articles about ESPN's redesign of their digital properties when it was introduced last year, and both mentioned the engaging aspect of the Now panel. We figured it'd be interesting to take a deeper look into why these curated real time news stream widgets are so popular and engaging for readers. The idea of real time, breaking news certainly isn't a new concept. News networks began implementing such news crawls during September 11, 2001 as a way to report the flood of news and breaking updates after the attacks. CNBC and other financial news networks preceded this by about two decades with the rolling stock ticker. Ever since then, it's been commonplace to see such news crawls on all news based programs. Of course, the Internet and Web came about and brought with it similar concepts, one of the more popular was standardized in RSS and subsequent widgets based off that protocol. So clearly, the idea of a real time content widget isn't a new thing so why the resurgence with large web properties utilizing them so prominently on their front page? With the explosion of content creators and distribution platforms, it becomes almost impossible as a content consumer to effectively sort through the noise. Twitter can be used as such a distribution platform, but it quickly becomes too noisy and fast moving for even the most expert Twitter user. This is evidenced by Twitter's recent explorations into their Moments feature ( curated tweets around a topic/event ), or their algorithm based timeline ( algorithmic curation around what Twitter thinks is most interesting to you ). These are both worthy efforts, and hopefully Twitter can get it right. But beyond Twitter's platform there's a whole Web worth of content and discussions that are occurring constantly. This has given rise to the idea and importance of influencers across social media and the Web in general. How influencers affect your popularity, readership, or revenue can't be understated. Again, not a new concept, previously these were authorities or celebrities that had a large enough voice and distribution platform to be deemed an 'influencer'. Technology has leveled that playing field making anyone with the dedication and passion to become an 'expert' or 'authoritative voice' in their space. The convergence of the Real Time Web, Social Media, a flattened publishing and media creation landscape means the sources for meaningful opinions, thought pieces, and media have surged to overwhelming levels. As a publisher you've built your audience and authority around a certain domain. The long form content and media you've created throughout the years is the foundation of your authority. But let's be honest, content creation, especially quality content creation is hard and takes time. So it's important that you bring more daily and return visitors to discover this quality content. But how do you entice your audience to visit more often? The solution is to be the authoritative curator around a domain on a daily, possibly even hourly, basis. That means leveraging the content created from the myriad other voices, authorities, and influencers in your domain. Whether you're a news organization trying to capture the latest news around #Brexit, or a fashion blog tracking the latest trends at New York's Fashion week; it's important that you have the best content curation tool to help you capture, discover, and publish these timely snippets of news to your audience. Beyond the technology, the fundamental key is to be highly selective and curative of the content. If you just let everything flow through to your audience, then it becomes no different than the RSS feeds of old, or a noisy Twitter stream. As an authority, your content curation tool should have the largest net to capture all relevant content from various distribution platforms, enabling you to quickly sort and filter the noise. Furthermore, it should allow you to easily and quickly publish ad-hoc content or content discovered manually by you or your team of curators. Whether it's an opinion from an influencer, a live video from the scene, or a blog post you need to ensure that the content you curate and ultimately publish to your audience is timely, relevant, and readily consumed. Furthermore, if you place your real time content widget to the side of your long form content, than you'll have a continual flow of readers and consumers discovering your longer form and higher value content, further cementing your organization or brand's authority in that space. Essentially this is how ESPN is using it's "Now" panel to attract audiences who are looking for quick bite sized news updates while simultaneously converting them into long time fans when they discover their expert analysts and in-depth articles. And conversely, by turning the dedicated ESPN reader into a daily frequent visitor searching for continual updates. Your publishing or content marketing strategy should be formed around this collaboration of your long form content and micro real time expertly-curated content. Ensuring your publishing and content strategy includes this form of micro highly targeted, highly curated content is crucial for today's digital publisher. What do you think? Do you think publishers can turn their weekly visits into multiple daily visits using a real time content curation platform? Let us know what you think.